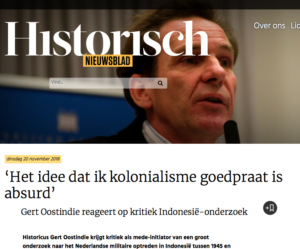 As the co-initiator of a major investigation into the Dutch military actions in Indonesia (1945 – 1950), historian Gert Oostindie is being criticized. Among others anthropologist Gloria Wekker is convinced that the researchers are aiming to condone Dutch war crimes. In Historisch Nieuwsblad, Oostindie says he finds the criticism shocking and absurd. Last year, partly due to the insistence of Oostindie, the Dutch government funded a large-scale investigation into the decolonization war in Indonesia. Some scientists and activists, however, have no confidence in the project and the people conducting the research. For example, anthropologist Gloria Wekker publicly stated that the research is set up in such a way that the in advance conclusions will be favourable for the Dutch. The research is carried out by the Dutch Royal Institute for Language, Country and Ethnology (KITLV), of which Oostindie is the director, the Institute for War, Holocaust and Genocide Studies (NIOD) and the Netherlands Institute for Military History (NIMH). Oostindie writes a summary of the results, which will be published in 2021.